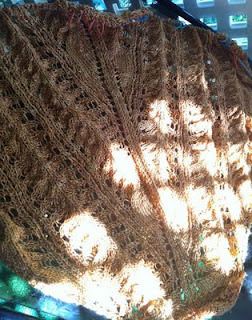 I've finally finished up the first set of repeats for this shawl, from Victorian Lace Today , and have started on the second set. I am so excited! 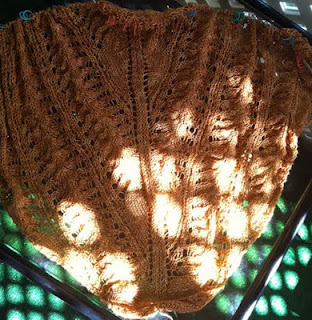 While I think it is beautiful now, apparently lace really isn't beautiful until it has been blocked. I love this pattern, the yarn (Handmaiden Sea Silk in Pumpkin) and am starting to not be intimidated by lace. Not to toot my own horn too loudly since this isn't done yet and there is still time for mistakes, but I am proud of myself for making it this far without having to frog. So here are some pictures of my progress. Sorry, they aren't too good. I am no photographer like my sis, whose beautiful work can be found on her site, Photography by Leah Richardson.